The Serverless AI Layer is your opportunity to gain a lead in your machine learning efforts. Deploying ML models manually is a common pitfall that most teams find out the hard way. It creates more work for high value team members, slows down shipping, and is guaranteed to become a patchwork mess. The AI Layer, on the other hand, automates, optimizes, and accelerates every step in model deployment and management. If you try to add deploying, managing, and optimizing ML models to your current team's workload your progress will slow to a crawl. The stack for deploying ML models is completely different from the rest of your software. The Serverless AI Layer lets your data scientists focus on data science, not DevOps. The Serverless Artificial Intelligence Layer uses both GPUs and CPUs, utilizes advanced hardware management to maximize performance and optimize cost, and scales up and down to match your needs. 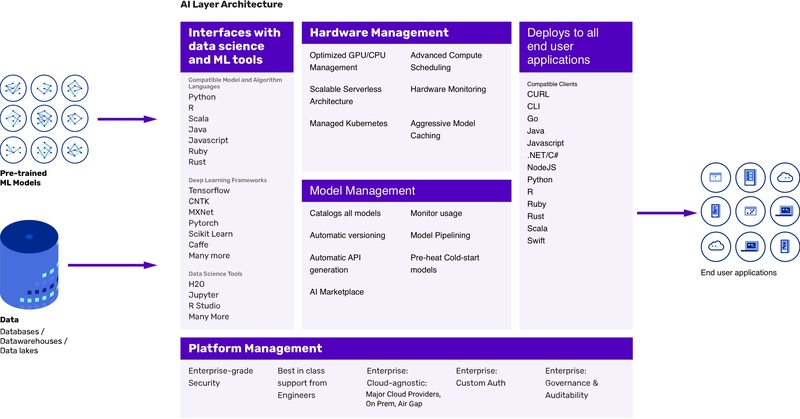 As someone that has spent years designing and deploying machine learning systems, I'm impressed by Algorithmia's serverless microservice architecture – it's a great solution for organizations that want to deploy AI at any scale. Are some of your models in R and others in Python? No problem. The AI Layer can run models, functions, and algorithms in most popular languages. The AI Marketplace has over 5,000 pre-trained ML models, algorithms, and functions available for you to incorporate into your data pipelines. The data scientists on your team are often re-writing code to collect, clean, and prep data—our serverless infrastructure makes pipelining simple and easy. When you work with Algorithmia, you have a direct line of contact and support from engineers and data scientists who ensure that your AI/ML model deployment is successful. You wouldn’t ask your graphic designers to merge pull requests—so why should your data scientists worry about DevOps and model deployment? Let them focus on what they do best: keeping up with the rapidly progressing field of data science and building awesome models. The AI Layer will run each of your models in parallel and allows you to pipeline the results together. Huge jobs can be performed quickly. Scheduling and utilizing the full power of your hardware is a huge challenge. Our advanced scheduler allows us to offer GPUs at the same low cost as CPUs. Our serverless infrastructure means that you only pay by the second when you’re actively using the models. Compute for ML models is extraordinarily spikey. The Serverless AI Layer will scale up and down by the second. You get the performance you need with none of the work or cost of managing the hardware. It’s simple. Git push your pre-trained model, algorithm, or function in the language of your choice—and a few seconds later you have an API endpoint ready for any scale. The amount of development time that goes into deploying ML models at scale is restrictive. That’s why big tech companies like Uber and Google have built their version of the AI Layer; Algorithmia makes these powerful tools available to everyone. Behind the scenes the AI Layer is making sure that your legacy models can continue to run without breaking any endpoints. This allows for easy testing between models. Our team of experienced engineers are here to help your ML deployments be successful. We’d love to give you a demo or give you credits for testing out your models.